I’m 12 days away from turning 30. I despise public speaking, but sometimes, I do it anyway. My hair is short, but I wish it were long. My husband is the best. I wake up every morning in our new house pinching myself over how beautiful it is. I miss my mom and my dad. This salad? Also life. Shall we? You guys know that turning dishes plant-based is my jam, so this salad has been a long time coming. This salad was inspired by one I had a while back when we were in France. We’d stopped at a cafe in Nimes and I ordered a Nicoise salad that was quite possibly the best I’d ever had – and probably ever will have – in my life. Nicoise salads are named for the Nicoise olives that adorn them, which can be found at most grocery stores (check the olive bar). Truth be told, any quality olive will do – especially green and kalamata. Simple perks? You betcha. Just 30 minutes required with a little fancy pants multi-tasking. Blanch green beans while boiling potatoes. Mash chickpeas then make dressing. A little of this, a little of that. Before you know it, you have a delicious plant-based powerhouse on your hands with more than 16 grams of protein and fiber each per serving. That’s a lot of plant power. This would make the perfect lunchtime salad or one to enjoy as dinner when you’re craving something on the lighter side that still satisfies. If you try it, let us know! We love your comments, ratings, and especially your #minimalistbaker hashtags on Instagram. Cheers, friends! 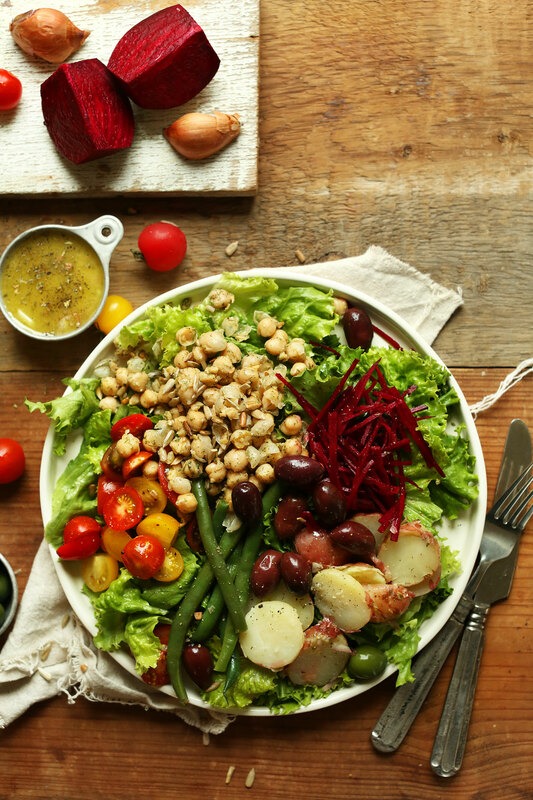 A plant-based version of classic Nicoise Salad with smashed chickpea salad in place of tuna. Fresh, satisfying, and ready in 30 minutes. Add potatoes to a small saucepan and add warm water until just covered. Bring to a boil over high heat, then reduce heat slightly to medium / medium-high until the water is at a low boil. Cook uncovered for 10-12 minutes, or until completely tender and when picked up with a knife they slide off easily. Then drain thoroughly and let cool on a cutting board. Once slightly cooled, slice into 1/4-inch slices. Set aside. While potatoes are cooking, fill a medium saucepan halfway with water and bring to a boil. Then add green beans or haricot verts and boil for 2-4 minutes, or until bright green in color and only slightly tender - they should still have slight crunch when bitten. While they're cooking, fill a large mixing bowl with ice water. Once the green beans are done cooking, drain thoroughly and immediately add to the ice water to stop the cooking process. Drain and pat dry - set aside. 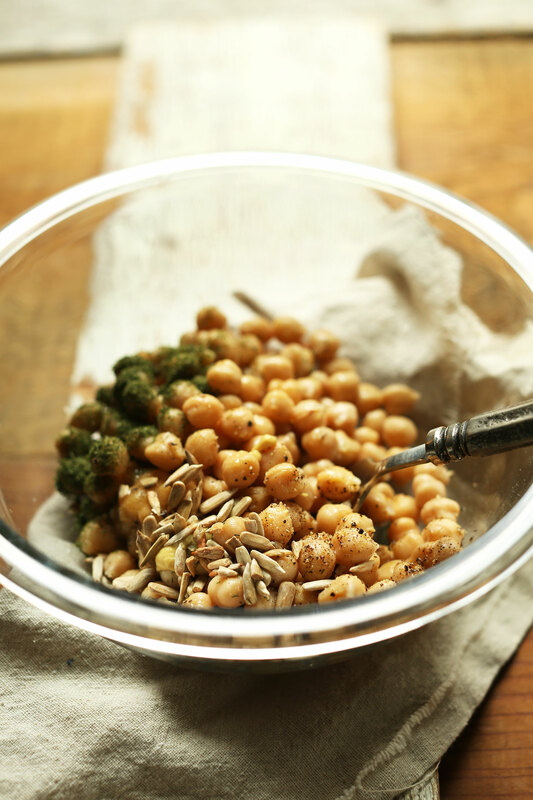 Add drained, rinsed chickpeas to a small mixing bowl, along with sea salt, mustard, maple syrup, dill, and sunflower seeds. Stir to combine and mash a few chickpeas to create texture. Set aside. 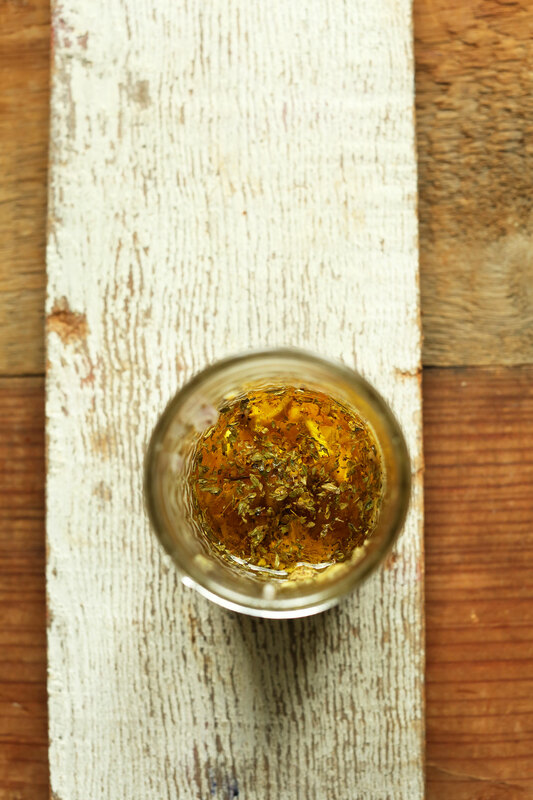 Add dressing ingredients to a mason jar (or whisk in a small mixing bowl) and shake vigorously to combine. Set aside. 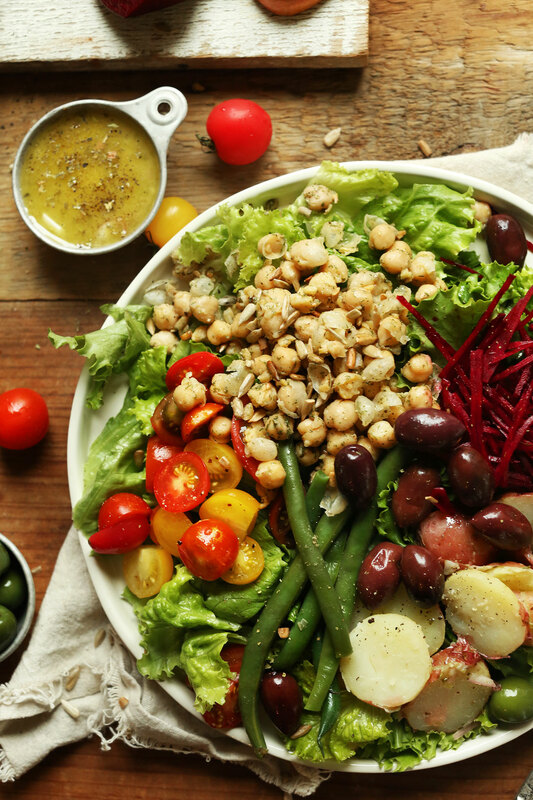 To serve, divide lettuce between two large serving bowls (amount as original recipe is written // adjust if altering batch size) or plates and top with chickpeas, green beans, potatoes, olives, tomato and beets (optional). Serve with dressing. Best when fresh, though leftovers pack/keep well up to 2 days when the dressing is stored separately. Store extra dressing (well-sealed) at room temperature in a dark place up to 2-3 days. *Salad + dressing adapted from Food Network. Chickpea mash inspired by my Chickpea Sunflower Sandwich. I made this last weekend and have been bringing it to lunch for work — and loving it! Instead of the potatoes — which probably would have made it even more delicious, but I’ve been working my way through a huge bag of potatoes and needed a potato-free meal or two — I roasted Brussels sprouts. Sadly, my doctor just told me that I’m allergic to yeast, which means that I need to avoid vinegar. I also can’t have citrus, so not sure how I’m going to replace the acid in the amazing dressing. Sigh. But for everyone else out there who can eat this salad, you won’t regret making it, because I’ll surely be dreaming about it for years to come. If anyone has any thoughts on citrus and vinegar-free acid, please give a yell. To make this wonderful recipe oil free, I used aquafaba from the chickpeas instead of olive oil for the dressing. I also used a cooked beet and added sliced radish and thinly sliced red onion. The chickpeas were wonderful! My favorite part of the salad. I did add a little minced red onion to the beans. Thanks so much for this recipe! This was the best Niçoise salad I have ever made. So easy. Love the compartmentalized instructions for garbanzo and dressing. The dressing was amazing! Great cooking tips overall. It was fun assembling and then eating it! It was like a firework of tasty things. Thanks so much! Love this recipe! I’ve made it a few times and it’s so satisfying. I like to add capers to the chickpeas, and chunks of avocado sprinkled with kala namak (black salt). It’s a really nice replacement for hard-boiled eggs! This was great! Made this tonight- added some cooked pearl barley to make it a heartier main dish, and it was very tasty. I will keep this recipe to make again! Yay! Glad to hear it, Laura! You make me a happy vegan! I have to say, I loveee nicoise salad and did miss it when I turned vegetarian some years ago. I love this recipe. I think I have made it close to 5 times now. I am a big fan of the maple mustard dill chickpeas. I had salade nicoise lots of times, mainly with fish and egg in it, one time my mother made a salade nicoise with chickpeas added to it, it was great. In a vegan dish the chickpeas replace the egg and they give added protein, which is good and good for the planet. The shallot dressing makes it special, it’s French I suppose, because Frenchmen often add shallots to their cooking, even to a boeuf stroganoff. I think I’ll try making this dish in that God-forsaken facility I live in, to feed the crowd who need good food, because no one else cooks fancy there, nor can they, and the shallot vinaigrette is certainly fancy. I’m 38! Although, may be showing wrinkles, cellulite, grays and definitely more hair loss than I’d like, I still feel awesome and look forward to turning 40. Despite the superficial changes, I’m still the fittest and youngest-looking gal in the bunch (pardon, the confidence;). Our exteriors will change but let’s hope our interiors change too…for the better, for ourselves and those around us. PS., sometimes I wish you’d time stamp your posts because I’m not sure when your birthday may have been. I am very low fat/oil so what could I sub for the olive oil? Hi! Do you have any other oils on hand? I haven’t experimented with other oil substitutes on this one but if you do, let me know how it goes! Made this tonight for my family and it was a big hit. My boys aren’t great fans of salad but they loved this. Thank you! I love this salad! I’ve made it at least half a dozen times now and it does not disappoint! It makes for a very hearty lunch and the mix veggies reassures me that I am getting a dose of goodness. I prep my shredded beets with their own dressing: lots of lemon, a generous dose of salt and some olive oil (a great way to eat them on their own, too). Ah la belle salade niçoise! 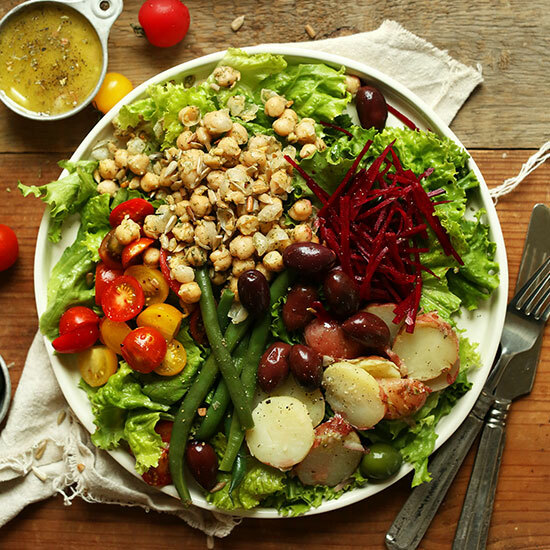 I love Salad Nicoise and am so excited to try a vegan version! Thank you for sharing. Thanks Emma! That’s so thoughtful! Mostly it’s that I’ve been dealing with hair loss and have cut my hair short because it’s quite thin now…I just miss my longer, thicker hair!! Super yummy and great combination of flavors that left me feeling very satisfied! I, too, LOVE, LOVE, LOVE Nicoise Salad. Usually, I make herb crusted salmon to go with it. but we are trying to transition to a primarily plant-based diet. Can’t wait to try your take on the salad…although, I will probably incorporate seaweed to get that delicious, briny flavor. As a former Vegan Baker/Vegetable Engineer in a Vegan Prep kitchen, I’ve come to love and appreciate beautifully prepared plant-based dishes. Slowly, but surely, my husband and son are starting to love them too! Thanks for sharing your inspiring recipes! Lovely food and absolutely GORGEOUS photography! And if you want to grow your hair long again, make sure that you FEED you hair with protein, zinc, vitamin C and silica! This salad is a great start! Doing all those things and more – hope something sticks! Dana, I listened to your podcast interview and want to thank you for sharing your personal struggle with hair loss. I started loosing my hair 8 years ago. The past year has been especially difficult as I’ve now lost at least 50% or more of my hair. No doctor has ever been able to help and I have felt so alone in figuring it out. I just bought The Modern Rapunzel you’ve talked so highly about and am hoping it will provide some answers. So much more I could write, but just wanted you to know I understand how scary it can be and how as a woman we can struggle to not let it define our beauty or value. At least for me, anyway. If you’d be open to sharing more of your journey on your blog, I’m sure it could be an encouragement and also educational to so many of us. I found you through Joshua Beckers Uncluttered course and find your blog to be an absolute delight! Thank you for sharing your beautiful self with all of us! Dana, I made this tonight and it was delicious! I had to tweak the dressing, I subbed red onion/garlic for shallot , but it was soo good. The potatoes soaked up the red vinegar -yum. Quite filling on a hot day here in the southeast! Thanks for the recipe! I did add beets, but I cooked them. When I red that receipe I knew I had to do It for supper tonight! It was “tout simplement délicieux”! ?? Thank you for all the good receipes that you share with us. Sad day! Free makeovers are always risky. Lessons learned. Hope you love this recipe, Shayna! The salad looks amazing! Can’t wait to try it out. What dis you use to shred/cut the beets so thin and even? This looks dreamy <3 Always love seeing your amazing creations, Dana! Wanted to wish you an early Happy Birthday! The salad looks amazing! I’m making this tomorrow. I was wondering, are the beets raw? Thanks! Hi there. I rarely comment on these recipes, because they are just so goo! However, I am making an exception today so I can make a suggestion I think you will find workable. It isn’t nicoise unless it has anchovies, garlic, and capers. I get around the anchovies by snipping with scissors a little of a sheet of kelp snack in, and just cutting the salt to compensate. The flavor of the sea arrives, without the fish. Brava on the rest! Totally get it! This is just my vegan adaptation. Hope you love it, Kim! What can I use for the thyme in the dressing? I think rosemary would be too strong. Can you suggest another herb? I think rosemary would be great, actually. Otherwise, maybe some oregano? This is my kind of salad! Wish I could get my husband to like beets. :) By the way, your hair is absolutely GORGEOUS short. Oooh nice!!!!! The salad and your upcoming birthday. I think as a culture, we fear aging. But really, I think as long as we are gracious about it and realize that when we treat our bodies and minds well, the rest will fall into place. I say bring it on! You’re an amazing person, and a constant source of inspiration. I doubt that will change with any number that quantifies how long you’ve dwelled on this earth. Congratulations! I don’t know what it’s like to be thirty just yet, but I hope you have a wonderful birthday when the time comes! 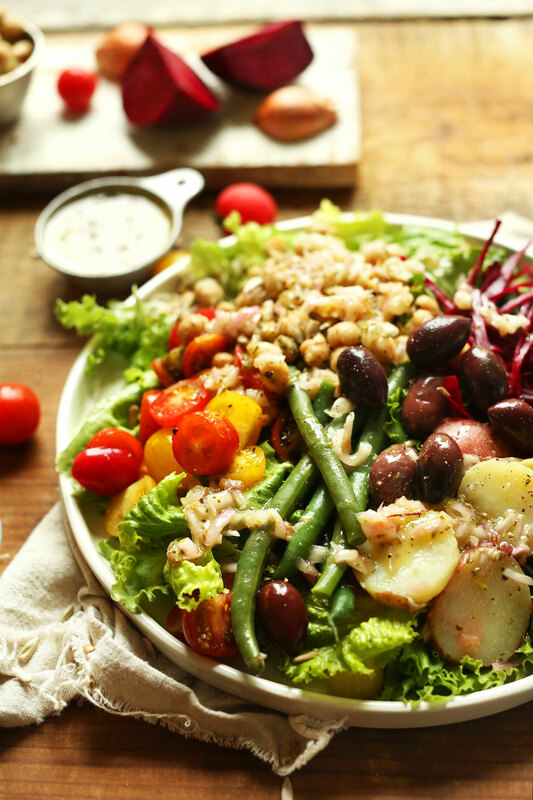 This nicoise salad looks wonderful! The beets and chickpeas just pop out so beautifully! Yes. Yes. Yes. And more YES. So delicious! Girl, You are making me hungry! Can’t wait thirty minutes. Can I eat the photo? Thanks for inspiration, beauty, and deliciousness, always! This is CRAZY! The salad looks amazing, and I was coming to your page to post about a possible recipe like this (full of a variety of veggies). Thanks!! I am over twice your age! And I don’t mind usually! My hair was extremely short but I figured if I ever wanted it long, I’d best get to it – that age thing again lol. So I am growing my hair out. Now, as to the salad it sounds great to me but my son is the vegan and he absolutely hates mustard! Doesn’t even want it on the table he’s eating at as he doesn’t even like the smell! So, what is a good alternative to use in place of it in this salad and dressing? Anyone have any ideas? I would just leave it out! I’ve been eating salads everyday and I will have to add this one to the list. I love all of these flavors and my favorite add to any salad, chickpeas. You are great :) I enjoyed reading your list of thoughts. Salad Nicoise was a very memorable meal for me when I was in Lyon, France in 2004 – eek! Wasn’t vegan then but I am very vegan now and really appreciate this recipe! I wish my hair were long again too. If you can grow it and it looks goddess like (not like in the dressing), than do it. I am 52 now and have not been able to grow it past my shoulders since my 30s and it never looks good – so I caved in and went very short. I change it up. I miss not needing it cut it regularly, and miss my long curly locks. But I do like the sassy short cut too. Do something wonderfully lovely and memorable for your 30th. It’s sweet how much you appreciate your husband, and your home. I miss my folks too. I’m turning 30 soon as well…ahhhh! This salad looks absolutely delicious! As much as I love this salad……was curious that you said your hair was short but in you pic it is long!!! My hair is dark brown and medium but I’m going through a 1/3 life crisis and may go blonde?!? And yes, watermelon is the best. We eat one everyday, but they do make you pee all night long so you have to be careful. And yes, you are are getting me to eat chickpeas again so thank you!! !